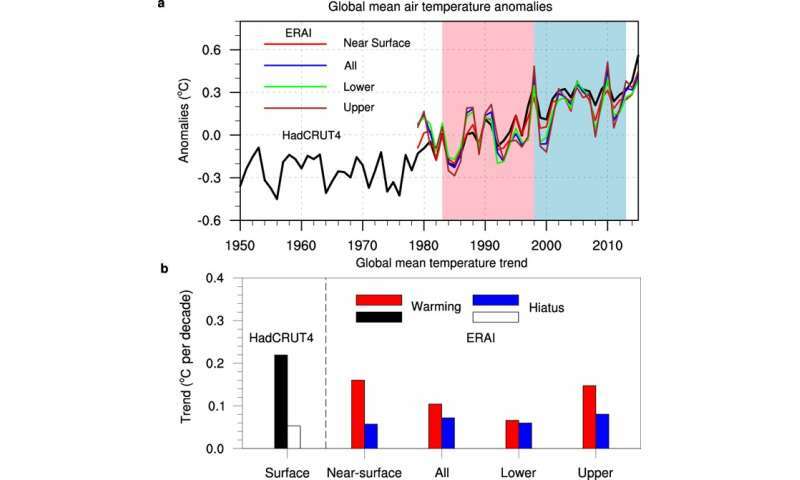 The increasing rate of the global mean surface temperature was reduced from 1998 to 2013, known as the global warming hiatus, or pause. Researchers have devoted much effort to the understanding of the cause. The proposed mechanisms include the internal variability of the coupled ocean-atmosphere system, ocean heat uptake and redistribution, and many others. However, scientists also want to understand the atmospheric footprint of the recent warming hiatus as the dynamical and physical processes remain unclear. As to why the surface latent heat flux, atmospheric dynamics and cloud-related processes showed such large differences between 1983-1998 and 1998-2013, LIU, first author of the paper, explained, "They are dominated by the Hadley Circulation and Walker Circulation changes associated with the phase transition of Interdecadal Pacific Oscillation (IPO)." According to LIU, the IPO is a robust, recurring pattern of sea surface temperature anomalies at decadal time scale. During a positive phase of IPO, the west Pacific and the mid-latitude North Pacific becomes cooler and the tropical eastern ocean warms, while during a negative phase, the opposite pattern occurs. The IPO has shifted from the positive phase to negative phase since 1998/1999, and this transition has led to the weakening of both Hadley Circulation and Walker Circulation, which served as a hub linking the three processes mentioned above. "Though the heat capacity of the atmosphere is nearly negligible compared with the ocean", said ZHOU, corresponding author of the paper, "understanding the atmospheric footprint is essential to gain a full picture of how internal climate variability such as IPO affects the global climate from the surface to the troposphere. The new findings also provide useful observational metrics for gauging climate model experiments that are designed to understand the mechanism of global warming hiatus."